Client(s) Challenge – Our clients L.S. and P.S., a husband and wife living in Northern Kentucky, got a foreclosure notice in the mail. They had worked really hard to get their house and even harder to get the mortgage modified after they both got laid off a few years ago. Now it looked like all those efforts were for nothing, because the bank was coming to take the house away. Lawrence and Associates’ Solution – Lawrence and Associates helped L.S. and P.S. file a Chapter 13 bankruptcy, with a five year repayment plan to get their mortgage caught up. Their monthly payment was something they could afford to pay, and the bank was not allowed to foreclose on their house. Results – L.S. and P.S. kept their home and are still living there to this day. If you are a Kentucky resident struggling to pay your debts, you need to take action. A Chapter 7 or Chapter 13 bankruptcy filing can put a stop to foreclosure or repossession actions, as well as wage garnishments, so that you can get a fresh financial start. It will also end the harassing phone calls and letters. You must comply with the terms of any repayment agreement or you will lose these protections, so it is important to have strong legal guidance before agreeing to anything. You want an experienced bankruptcy to protect your interests. At Lawrence & Associates, we provide comprehensive counsel in Chapter 13 bankruptcy matters to people throughout Northern Kentucky. We will take the time to listen carefully to your questions and concerns, and explain the law and the process, as well as your options. We will help you identify your needs and goals, so that we can tailor our counsel to your specific situation. If you don’t qualify to permanently discharge debt under Chapter 7 or prefer to set up a new payment plan with your creditors, we will help you reorganize your debt in a Chapter 13 bankruptcy filing. We will prepare and file all the necessary paperwork to complete the process and will represent you in hearings or meetings with creditors, the bankruptcy trustee or the bankruptcy court. We will help you put together a reorganization plan and will review all proposed repayment plans to ensure they are appropriate. When you file for protection under Chapter 13, an automatic stay goes into effect, which prevents your creditors from calling, writing or using any other means to collect the debt, other than through the bankruptcy proceeding. The automatic stay will suspend foreclosure or repossession actions, as well as wage garnishments, giving you time to get back on your feet financially. In many instances, you will be able to reduce the amount you have to pay, sometimes to as little as a penny on the dollar, by entering into agreements with your creditors. A Chapter 13 bankruptcy can be ideal for someone with large medical bills or credit card debt, allowing you the opportunity to keep most or all of your assets and enter into payment arrangements that are workable. There is a pervasive myth in American society that attempting to negotiate down the amount of one’s debt is a bad thing. This myth is designed to keep you poor, and beholden to the interests of the banks, credit card companies, and other lenders that you’ve met during your quest to live a happy, normal life. The truth is that you have every right to negotiate down your debts, and that the lender or collection agency will usually work with you if you stand your ground and dangle a carrot in front of them. Don’t forget that the fees, fines, interest rates, and negative remarks on your credit report are not unchangeable, universal laws physics that cannot be altered. They aren’t laws at all, actually; rather, they are only policies, arbitrarily set by the lender (and often arbitrarily changed by them, too). Policies that are set arbitrarily and changed arbitrarily can be negotiated. Also, don’t forget that the lender you are using is a business, and it is in competition with every other lending business out there. If the lender is faced with a choice of waiving a few late fees or watching you walk to their competitor and pay them exorbitant interest rates for a while, then it’s no choice at all. The lender would much rather work with you than watch you walk to a competing Northern Kentucky business. In a bankruptcy, you have the ability to force the lender to take nothing (or much less than 100%) in return for their loan. Obviously, this is the worst possible outcome for the lender, and you have a Constitutional right to spring it on them at any time. The lenders know this, and this is a principal reason that they continue to perpetrate the myth that rearranging your debt is a sin; absent any legal way to prevent you from using your trump card, they try to convince you that the trump card is evil. Calling bankruptcy a trump card, by the way, is poetry because Donald Trump has filed for bankruptcy on multiple occasions. The belief in this myth is a major way that the thinking of wealthy people and business owners differs from the thinking of the poor and middle classes. Wealthy people and business owners don’t feel bad about filing bankruptcy or re-negotiating debt; it’s just another business decision. That decision should have no different connotations for you. When dealing with a Northern Kentucky lender, remember to be firm and remember that you have rights. The person you are talking to almost certainly has some ability to help you. If not, his or her supervisor does. However, you’ll catch more flies with honey than vinegar. That means you must be polite and calm. Calling them in a temper tantrum won’t solve anything. They don’t have to help you, any more than you have to work that extra shift to pay their bill. If you have a lender that is abusive – including calling you at odd hours, calling friends and family about your debt, calling you at work, or telling you they’ll have you arrested – ask for the person’s name, employee number, direct line, or any other identifying information you can think of. Tell them you are gathering this information in order to file a Fair Debt Collections Practices Act (FDCPA) violation complaint. If that doesn’t change their tone, get a lawyer to deal with them for you. And if the lender really won’t budge, or if you have so many lenders that you can’t pay the bills even if they do try to help you out, then get ready to file a bankruptcy. Bankruptcy wipes the slate clean and gives you a fresh start. Lawrence & Associates are Northern Kentucky lawyers who fight for the rights of debtors just like you, every day. Lawrence & Associates can help! Know How Kentucky Personal Injury Protection (PIP) Affects You! Insurance policies are generally quite confusing and often vary between insurance companies. Most of them promise you a better rate, or better coverage in the event of an accident. Knowing what some of the standard policies cover will help in choosing the right coverage for you. For example, one thing that does not vary between insurance companies that do business in Kentucky is the minimum PIP coverage. PIP stands for ‘Personal Injury Protection’ (also known as Basic Reparation Benefits in other states). In Kentucky, every car insurance company licensed to sell insurance in the Commonwealth is required to provide $10,000 of minimum No-Fault benefits in the case of an automobile accident. This minimum benefit amount is per person, and it covers medical expenses and/or wage losses attributed to the accident. PIP also may allow for an extension of time in which you may file a claim resulting from an automobile accident. Generally speaking, in Kentucky the statute of limitations is two (2) years from the date of the accident/collision. However, if PIP benefits are paid, then the statute of limitations will be extended by two (2) years after the LAST PIP payment. For example, let’s say you’re involved in a car crash while driving on I-71 in Kentucky on January 1, 2014. You will have until January 1, 2016 to file a claim/suit against the other driver (assuming a valid claim exists against him/her). However, if you are injured in that car accident and your last medical bill is paid by your PIP on July 1, 2014, you will have until July 1, 2016 to file the lawsuit. If you or someone you know is dealing with an accident related injury in Kentucky or Ohio and have questions regarding PIP, workers’ compensation, or other things regarding an injury claim, please do not hesitate to contact Lawrence & Associates for more information and assistance. We can help! The 6th Cir. Court of Appeals, which covers Kentucky, Ohio, Tennessee, and Michigan, says debtors in Chapter 13 bankruptcies can’t contribute to 401k or retirement plans while they are in bankruptcy. If you are a debtor in a Chapter 13 bankruptcy, this decision is bad for you because it causes you to have a higher payment to the trustee. It also takes away your ability to save for retirement. The whole point of bankruptcy is to get a “fresh start”, and part of getting a fresh start is having the ability to save for retirement. If you are a taxpayer, this is also a really bad decision. People that haven’t adequately saved for retirement are more likely to take advantage of Medicare, Medicaid, and Social Security for longer periods of time (i.e. before age 67). An increase in the need for these programs will worsen the country’s debt problem and may increase taxes down the line. We all know that most people don’t save for retirement adequately. The bankruptcy system should force debtors to put money toward their retirement, not prohibit them. Instead of maximizing the amount of money creditors can get, maximize the benefit to all taxpayers in general. Most creditors are multi-billion dollar corporations, and many of them received bailouts during the great recession. There’s no reason the law should continue backstopping their bad lending decisions at the cost of regular people’s future. It can be tough staying current on bankruptcy law and it is one of the many reasons that Northern Kentucky bankruptcy filers need the services of a skilled bankruptcy lawyer. “We’ve Got You Covered.” If you live in the Northern Kentucky area, including Boone, Kenton, Campbell, Grant and Gallatin Counties, Lawrence & Associates can help you with your bankruptcy. Call us today for a free consultation! I have been at Lawrence & Associates since 2011. When I first started at Lawrence & Associates, I gained hands on experience in the areas of workers’ compensation, bankruptcy law, personal injury and admiralty law. However, I quickly learned that I wanted to focus my practice on one area of law and learn as much about that one area as possible rather than try to master several areas of law at one time. I chose to concentrate on workers’ compensation because I like the mechanics of it. With workers’ compensation, I get to meet with clients face to face on a regular basis, negotiate with adjusters, draft motions and briefs, file claims, depose doctors and other witnesses and attend hearings without intense trial preparation that other areas of law sometimes require. Lawrence & Associates stands out from our competitors because we are small enough to give each and every one of our clients personal attention, yet we are large enough to handle a large volume of cases. 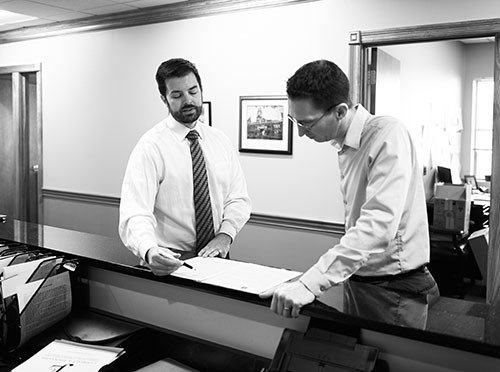 At Lawrence & Associates, an attorney meets with each new potential client during the initial consultation, which allows the potential client to have his or her questions answered by the attorney who will handle the claim. Additionally, our staff is very personable and always makes our clients feel very comfortable. Workers’ compensation is a very competitive area of law and it’s difficult at times to stand out from our competitors, especially in the Northern Kentucky area. Further, because I practice in Kentucky, I am not able to directly solicit clients which adds a wrinkle to advertising. I would say making myself and Lawrence & Associates known in the area of workers’ compensation is the most difficult challenge that I face. I would say my greatest accomplishment isn’t in the past, it’s the present, this moment, the ‘right now’. I’ve worked hard to be where I am today and I’ve found a career that I love… that’s a pretty great accomplishment. To me, there’s no better feeling than knowing that I have the power to help someone who needs me at a difficult time in their life. I have the opportunity to help people in the community and their families each and every day. Outside of work, I am very involved at Crossroads church in Florence, KY and also with the City Gospel Mission. Additionally, as those who know me can attest, I am also very involved in the local crossfit community and like to spend my free time training and competing with my friends and teammates. Finally, I enjoy spending time with my friends, family and of course, my husband and our two fur babies. People often tell me that I’m an easy person to talk to. While this isn’t necessary a talent, this is a quality that I consider very valuable, especially in my field. I genuinely care about each and every person that walks in our door so listening and wanting to help my clients solve their problems, sometimes at their worst moments, comes very naturally to me. In my opinion, in order to be a successful attorney, you need to be able to show empathy and compassion towards your clients. My mother has always been a go getter and my biggest fan. She shows me every day that hard work pays off and that most great things in life won’t happen by chance, but by choice. I try to lead my life as my mother does by working hard and by taking risks and putting myself out there. Melissa has handled all types of workers’ compensation cases. She will work to build a strong and successful case for you. If you or someone you know has a Workers’ Comp issue, please contact a Northern Kentucky or Ohio Workers’ Compensation Attorney today. Lawrence & Associates can help! Does Filing Bankruptcy Affect a Co-Signer’s Credit? Many people who file bankruptcy in Northern Kentucky have co-signers on their debt. For some, the co-signer is part of the reason they are filing bankruptcy in the first place! I cannot count the number of parents I have met who have had to file bankruptcy because they were sued when a child defaulted on car payments. Similarly, I have helped quite a few people file bankruptcy because an ex-spouse defaulted on the mortgage that both spouses signed before the divorce. The answer is straightforward, but there are a few factors that need to be considered before you arrive at a plan to deal with the debt. In short, if you file bankruptcy, your social security number is the one the bankruptcy attaches to. A co-signer’s social security number will not be involved, and thus the bankruptcy does not go on their credit. At most, the co-signer’s credit report will receive a notation, on the particular debt in question, that a bankruptcy was filed on that debt. This should not affect the co-signer’s credit score. Can Creditors Come After Co-Signers After Kentucky Bankruptcy Proceedings Are Started? The bigger and more important issue is the matter of whether the creditor can sue or demand payment from the co-signer. If the co-signer has not filed a bankruptcy of his or her own, then the co-signer might be forced to pay the debt. This can be avoided if you continue to pay on the debt, and there are several ways that this can be accomplished, including by filing a reaffirmation or by paying the debt through a Chapter 13 payment plan. Protecting co-signers during a bankruptcy is one of the many reasons that Northern Kentucky bankruptcy filers need the services of a skilled bankruptcy attorney. If you or someone you know may need to file bankruptcy, contact a Northern Kentucky Bankruptcy Lawyer today. Lawrence & Associates can help! What Injures are Covered Under Workers’ Compensation? To be covered by workers’ compensation, an injury need not be caused by a sudden accident such a fall. Workers’ compensation may also cover claims for injuries due to repeated physical motion like a straining your back from lifting heavy boxes or from the repetitive motions of driving a bus for a long period of time. Also, workers can sometimes be compensated for the effects of psychological stress caused by the job in addition to any physical injuries. With a few exceptions, any injury that occurs in connection with work is covered. The legal boundary is that employees are protected by workers’ comp as long as the injury happened “in the course of employment.” For example, a traveling nurse would be covered by workers’ comp while making service calls to patients and when visiting patient’s homes, but not while traveling to and from work for the day or while traveling to a purely social dinner later that evening. Injuries that can be shown to have been intentionally self-inflicted by the employee, or to have been caused by substance abuse, generally are not covered. However, courts have often sided with the injured worker when such cases are disputed, ruling that the injury is covered as long as the employee’s behavior was not the only thing that caused the injury. The legal definition of when you are working, for workers’ compensation purposes, also has expanded in recent years to cover a greater number of injuries. For example, employees who were injured playing baseball or football on a company-affiliated team have been allowed to collect workers’ compensation benefits for those injuries. If you or someone you know has a Workers’ Comp issue, please contact a Workers’ Compensation Attorney today. Lawrence & Associates can help injured workers in Ohio and Kentucky. Call today for a free consultation. Chapter 13 is a type of bankruptcy that allows consumers who are struggling with debt to seek relief through the court. Chapter 13 is commonly used by people who are facing home foreclosure, as it can stop that process in its tracks. A debtor must meet Chapter 13 requirements to file for bankruptcy under this chapter. Unlike a Chapter 7 bankruptcy, which allows the debtor to discharge some debts in exchange for the sale of nonexempt property to pay creditors, Chapter 13 allows the debtor to keep their property and repay creditors in a three or five year court-approved repayment plan. If you’re struggling to pay your bills each month, filing for bankruptcy under Chapter 13 may allow to you get back on track by reorganizing your debts into one affordable monthly payment; however, there are certain requirements that must absolutely be met in order to file for a Chapter 13 bankruptcy. A Kenton County, Kentucky bankruptcy attorney can determine if you are eligible for a Chapter 13. If you don’t qualify to permanently discharge debt under Chapter 7 or prefer to set up a new payment plan with your creditors, Lawrence & Associates will help you reorganize your debt in a Chapter 13 bankruptcy filing. We will prepare and file all the necessary paperwork to complete the process and will represent you in hearings or meetings with creditors, the bankruptcy trustee or the bankruptcy court. We will help you put together a reorganization plan and will review all proposed repayment plans to ensure they are appropriate. If you or someone you know needs to file a Chapter 13 bankruptcy, contact a Northern Kentucky Bankruptcy Attorney today. Lawrence & Associates can help! After an auto accident some people aren’t sure whether they should hire an attorney at all. It’s also tough to decide which Northern Kentucky attorney to hire to represent you in your dealing with insurance companies. No matter what, it is always a good idea to hire an attorney – a good attorney – to represent you in an automobile accident and/or liability claim. Look no further than the insurance industry itself for proof of this fact. Insurance companies’ internal statistics reveal that claims asserted by attorneys settle for an average of fifty percent higher than claims asserted by claimants without an attorney. On average, you leave fifty percent of the money you deserve, by law, on the table when you decide not to hire an attorney. It doesn’t take long to realize this is a bad deal for you. Remember that insurance company adjusters are trained to pay out as little as possible in any auto accident claim. Further, under Kentucky law the other driver’s insurance company doesn’t have a duty to pay you a fair settlement. Whether these adjusters have an ethical duty to treat injured people fairly is never considered by the insurance company. Insurance companies have a legal duty to investigate the claim, but rarely is a claim’s investigation fairly handled. Rather, insurance company’s use this opportunity to ignore or minimize facts helpful to the injured Northern Kentucky resident and to emphasize other facts that often have no relationship to whether or not an injury occurred. In truth, none of these things tell the story of your injury, and your claim should never be declined or paid in less-than-full because of these things. A good Northern Kentucky auto accident attorney can help you minimize the effect of liens from health insurance companies and medical providers after your verdict or settlement. Some laws, such as the Medicare Secondary Payer Act, are very complex and almost impossible to wade through even for some attorneys. If you don’t have attorney, the people that are supposed to be on your side – your own insurance company or your medical providers – will often take more of your settlement or verdict than the law requires you to pay. In short, the injured Northern Kentucky resident is often caught between multiple insurance companies, both auto insurance and health insurance, and medical providers who are sophisticated and want to be paid with money that should compensate the injured person for his or her injuries. The unrepresented injured person is often taken advantage of. A full-time Fort Mitchell Kentucky personal injury attorney knows that reaching a resolution with the other person’s insurance carrier is only half the battle, and takes pride in maximizing his or her client’s recovery. Lawrence & Associates Law Firm also helps auto injury victims in Ohio receive the compensation they deserve. Call us today! Determinants of Total Compensation for Auto Bodily Injury Liability Under No Fault; Investigation, Negotiation and the Suspicion of Fraud, published in Insurance and Risk Management, volume 71, January 2004, at pages 633 through 662. What is an Automatic Stay and How Does It Affect Me? When you file for Chapter 7 or Chapter 13 bankruptcy in Kentucky, the automatic stay immediately goes into effect. The automatic stay prohibits most creditors from continuing with collection activities, which can provide some relief to debtors. Utility Disconnections – If you’re behind on a utility bill and the company is threatening to disconnect your water, electric, gas, or telephone service, the automatic stay will prevent the disconnection for a period of time. Foreclosure – If your home mortgage is being foreclosed on, the automatic stay temporarily stops the proceedings, but the creditor will often be able to proceed with the foreclosure eventually. If you are facing foreclosure, Chapter 13 bankruptcy is usually a better remedy than Chapter 7 bankruptcy, if you wish to keep your house. A Northern Kentucky bankruptcy attorney can help you determine this. Eviction – If you are being evicted from your home, the automatic stay may provide some help; however, there may be a few wrinkles. If you are facing eviction, it is in your best interests to speak to an experienced bankruptcy attorney. Collection of Overpayments of Public Benefits – If you receive public benefits and were overpaid, normally the agency is entitled to collect the overpayment out of your future checks. The automatic stay prevents this collection. Multiple Wage Garnishments = Filing for bankruptcy stops garnishments dead in their tracks. Although no more than 25% of your wages may be taken to satisfy court judgments (up to 50% for child support and alimony), many people file for bankruptcy if more than one wage garnishment is threatened because garnishments can be detrimental to an employee’s paycheck. Lawrence & Associates’ Bankruptcy attorneys are dedicated to helping Northern Kentucky families get the help they need. We serve all of Boone, Kenton, Campbell, Gallatin, Owen and Pendleton County, as well as other counties in the surrounding areas. Come see us at our Fort Mitchell, Kentucky office today.